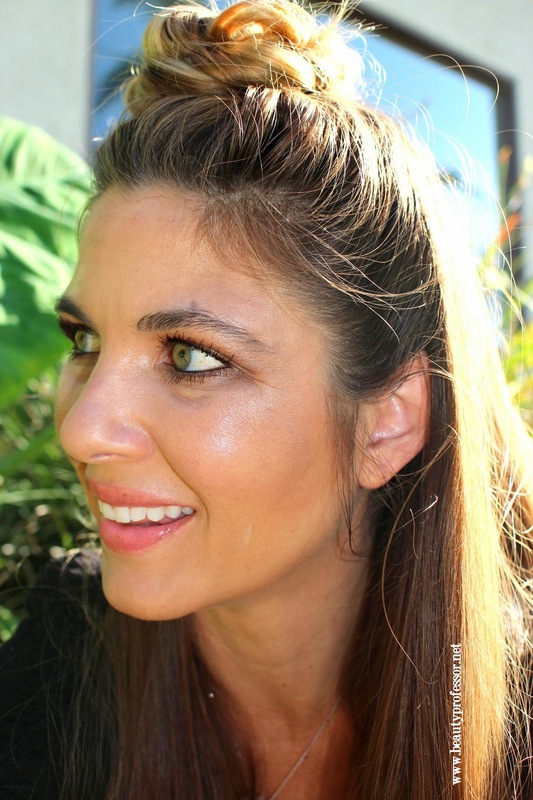 Beauty Professor: Jouer Summer 2014 Collection: Rosy Glow Anyone? Jouer Summer 2014 Collection: Rosy Glow Anyone? I have sung the praises of the chic Jouer Cosmetics line many times over (HERE, HERE and HERE, for reference) and their new summer collection (previewed and discussed HERE and HERE) is no exception. 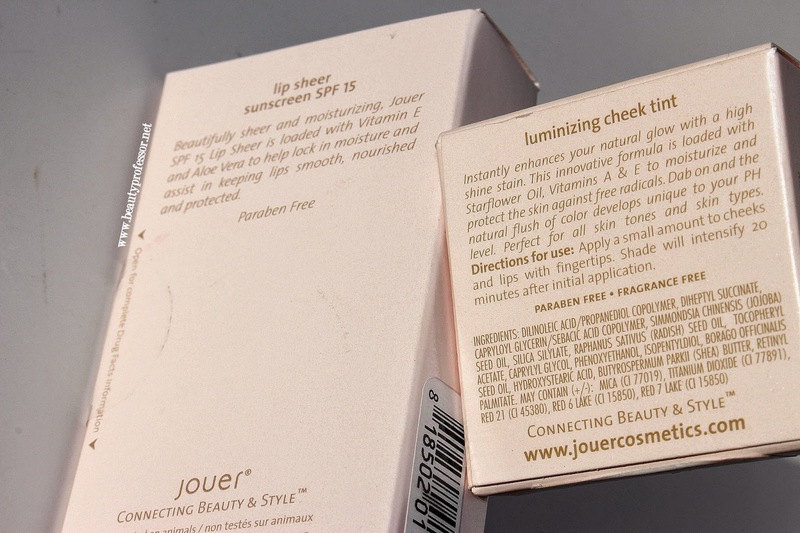 Consisting of two gorgeously sheer products that embody the very nature of the "rosy glow," the Luminizing Cheek Tint and Lip Sheer SPF 15 are perfect for all seasons due to their ability to subtly brighten the face with a certain je ne sais quoi that looks both effortless and polished. Above: A close up of the Luminzing Cheek Tint and Lip Sheer in direct sunlight...the beauty alchemy occurs in the application phase! The Luminizing Cheek Tint in Rosy Glow is a gel-based blush with shimmering golden luminosity. The blush reacts with one's own chemistry to develop into the most flattering shade of glowing, "just blushed" pink. When first swatched, it is tempting to think that this blush lacks color payoff; have patience, lovelies, because over the course of a few minutes (up to 20), the magic happens! I love the fact that this blush is radiant and light; sometimes self-adjusting products default to hot pink but such is not the case with the complex Rosy Glow. The blush is moisturizing but not over-emmolient as to slide all over the face...I get remarkable lasting power and the glow persists from application until removal! The Lip Sheer in Sheer Rosy Stain is ultra-hydrating (it feels like a luxurious lip balm) and easy to apply without a mirror; the softly-flushed results are a delightful surprise! Silky and smooth with no perceptible shimmer, this stain maintains a position in "light pink territory." As aforementioned, products that work with one's pH can sometimes over-intensify but the lip sheer stays subtle and demure, developing into a blushing pink that compliments the natural tone of one's lips. The fact that it contains SPF 15 makes it a brilliant choice by itself or under lip color year round! Above: The "back matter" for both products. Consistent with all other Jouer products I've tried, neither one has irritated my extremely sensitive skin whatsoever! Above: A swatch of the Luminizing Cheek Tint in Rosy Glow in direct sunlight...the effect was at the starting phase of development when the image was taken. Above: A swatch of the Lip Sheer in direct sunlight. Above: Applied to the apples of the cheeks, the glow is delicate and lasting. Above: The Lip Sheer developed to its maximum depth. Above: The Jouer Rosy Glow. Bottom Line: The Jouer Summer 2014 Collection Cheek Tint and Lip Sheer possesses all the qualities necessary for a breezy, sophisticated rosy glow. I have had such fun incorporating these gems into my summer makeup routine and, due to their ease of application and aesthetic versatility, am confident that they will great use all year. Highly recommended! Good things ahead on BP including a beauty innovations post and a new foundation review! **PR sample provided for review however, as always, all of my opinions are expressly and unequivocally my own. © 2012-14 Beautyprofessor® All Rights Reserved. Do not copy, reprint or republish content and/or photos without author's written permission.